However, such argumentative interactions — particularly those that operate on a conceptual plane — are relatively rare, especially in scientific and other disciplines taught in school. There are undoubtedly good reasons for this (see e.g. Golder, 1996; Quignard & Baker, 1999; Quignard, 2000). For example, the topic must be intrinsically debatable, students must be motivated to argue with respect to it, there should be an appropriate intersubjective distance between students’ points of view (c.f. Rommetveit, 1979), students should have sufficient knowledge of the topic, interpersonal relations and socio-institutional factors should not prevent free expression of divergent views, and so on. One particular paradox concerning conditions for argumentative interaction and for learning itself is especially important here: in learning situations that are designed so that students will co-construct new knowledge, by hypothesis, they will not have the kind of coherent and firmly entrenched points of view that could lead to dialectical confrontation (Nonnon, 1996). We should thus expect that students’ discussions would rather correspond to a cooperative exploration of a dialogical space. In this paper, we refer to such a space that is explored by students’ in cooperative learning situations during their argumentative interactions, as the space of debate.The goal of the research described in this paper is thus to understand how to design collaborative learning situations so that students will be led to broaden and deepen their understanding of the space of debate (see §2 and 4 below). We term this type of learning “CABLE”: Collaborative Argumentation-Based LEarning. We consider a specific type of collaborative learning situation, in which students’ activity is mediated by use of a Computer-Supported Collaborative Learning (CSCL) environment (see e.g. Koschmann, 1996) called DREW[i], that was developed within the framework of the SCALE project*. DREW provides a variety of Web-based tools to communicate and carry out joint problem-solving tasks, including a typewritten synchronous CHAT tool, a collaborative text-writing tool and — especially important in this context — a tool for jointly drawing argument graphs via the web. Given the strict conditions for CABLE that we have already described, the attempt to design a CSCL environment for this purpose may appear paradoxical, since constraints that are inherent in such situations are well known. For example, free expression of ideas and arguments should be more inhibited in typewritten computer-mediated communication (CMC) than in face-to-face spoken communication (c.f. Clark & Brennan, 1991), and lack of co-perception should cause coordination problems. However, face-to-face situations have the disadvantages that students’ communication can be largely inefficient or redundant, and that it is difficult to control effectively the carrying out of sequences of tasks. CSCL environments can also be seen as having several counterbalancing advantages. On one hand, CSCL environments enable complex sequences to be structured; on the other, there is now some evidence that typewritten CMC can encourage students to reflect on the recorded trace of their interaction, and to ‘filter’ their communication so as to only express more complex aspects of problem-solving (Tiberghien & de Vries, 1997). Here we concentrate on the principles underlying design of teaching materials for CABLE, together with sequences of tasks in which they are to be used, in relation to characteristics of CSCL tools. We report results of an experiment carried out at secondary school level, during which students debated about Genetically-Modified Organisms (GMOs) using DREW, in one condition using CHAT and in another using CHAT together with an argument graph tool. In addition, we briefly describe a new method for evaluating broadening and deepening understanding of the space of debate, called the QED method, on the basis of analysis of students’ texts produced before and after their debates. In conclusion, we discuss further research for design of CSCL situations that more effectively favour CABLE. The design of teaching materials, or pedagogical texts, for collaborative argumentation-based learning at school must satisfy several different types of constraints. Firstly, it must be possible to integrate the topic of debate within national curricula. On the basis of a review of official programmes in France (see http://www.education.gouv.fr/sec/), we chose the topic of genetically-modified organisms because it is a topic that is dealt with in the Life and Earth Sciences programme, this being the only scientific subject that is genuinely open to the study of contemporary problems that are debated in society at large (e.g. ecology, public health, etc.). In addition, this topic can also be dealt with in the Civic Education programme, as well as in French (maternal language) class, where argumentation is a specific content to be taught. Secondly, the actual content of the teaching materials on GMOs must be practically readable within school timetable constraints. 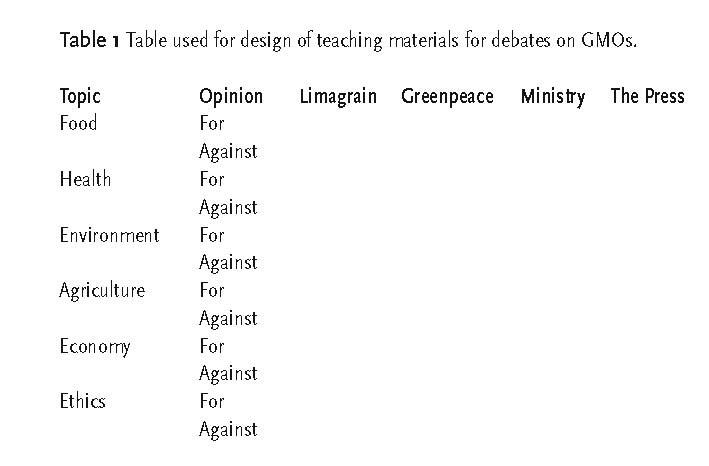 Finally, as a basis for CABLE, the teaching materials must present a wide and balanced set of arguments and points of view with respect to GMOs (breadth of the space of debate), together with information about key concepts such as “gene” (depth of space of debate). We created new teaching materials on the basis of a number of primary sources (notably websites) that corresponded to clearly identifiable ‘voices’ of social actors implicated in the question of GMOs. They included “Limagrain” (a major grain producer), the French Research Ministry, Greenpeace (a non-governmental organisation concerned with ecology), and several recent press cuttings (e.g. from Le Monde). Within the voice of each social actor, several epistemological points of view are represented, such as scientific, agronomic, economic and ethical points of view. The dimensions of social actors and of epistemological points of view are distinct since, for example, each social actor selects and represents the scientific ‘facts’ in a different way. We chose to group teaching materials according to social actors so as to facilitate the identification, subsequent ‘ventriloquation’ and appropriation of these voices (Bakhtine, 1929/1977) in students’ debates. 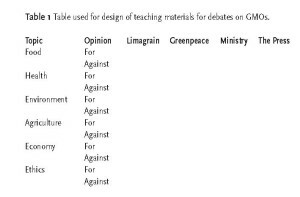 In order to check coverage of the materials in these terms, voices of social actors and for/against arguments were analysed using Table 1 below. – Ministry of Research / economic argument: “Even if it is difficult, for the present, to evaluate potentialities of these new technologies, their appearance on the world market risks affecting markets in developing countries, with competition playing in favour of the North, that could benefit from specific products, thus increasing unbalance. Following this hypothesis, it appears important that researchers or producers in the South should be able to use existing techniques if they wish”. – Greenpeace / economic argument: “Certain multinational companies try to make us believe that GMO are used to give better yields and to reduce hunger in the world. However, harvests are sufficient to feed the whole planet; the problem is rather that of the sharing out of food”. From the use of conditional and hypothetical expressions, it is clear that the Ministry wishes to express a ‘balanced’ or ‘objective’ voice, that informs but does not adopt a position, whereas Greenpeace clearly argues against a putative support for GMOs (reducing hunger in the world). The materials were designed in collaboration with French and economic science teachers to check their educational usability and understandability by students aged 17-18 years. Clearly, it is not feasible to simply give these materials to students and ask them to “debate” with the Internet tools. They need to be prepared for debating, in terms of acquiring appropriate knowledge of the domain, the tools to be used, and argumentation itself; they also need to consolidate the knowledge co-constructed in the debate. We therefore designed a specific task sequence within which the teaching materials were to be used, that is summarised in Figure 1(ii). The training phase (0), of 2 hours’ duration, comprised a short introduction to argumentation notions and techniques that would be necessary during the debate phase (2), including use of Toulmin-like diagrams (Toulmin, 1958) to represent theses, pro and contra arguments. In addition, students were trained on the DREW interface tools. The rationale was that since students were supposed to learn from the debate phase, this would be hindered if they also had to learn concurrently how to use the tools. During the preparation phase (1), students were given the teaching materials on GMOs to read (during their own time), together with the same table that was used for design of those materials (Table 1 above), with which they could take notes. The pedagogical rationale was that such guided reading would enable better memorisation of which social actors made what argument about which topic, thus helping to initially structure argumentative knowledge. At the beginning of the phase that took place in class, after re-familiarising themselves with the dossier on GMOs, the students were asked individually to write a short text presenting their own opinions, and associated arguments, on the question: “Should the production of GMOs be allowed or not?”. The pedagogical rationale of this sub-task was firstly to enable students to render explicit and reflect upon their personal opinions, and secondly, to enable them to further structure the argumentative knowledge filled-in by the students in note form in Table 1. The ensuing debate phase was carried out either using a CHAT interface, or else using the CHAT in combination with an argument graph (see below). In both cases, students were asked to each express their opinions and provide arguments for them, then to explore and deepen the question together in order to subsequently enrich their individual texts. Within the last 10 minutes of the debate, the students were asked to sum up their points of agreement and disagreement. The pedagogical rationale of this phase was that by interacting together, students would deepen and broaden their understanding of the space of debate, by various means: acquisition of new arguments from their partners, refinement of their own understanding by expressing arguments and by understanding criticisms of them, negotiating refined meanings of key concepts (such as the notion of genetic modification). In the final phase of the task sequence (3), students return to individual work, and are asked to improve their individual texts, in the light of the discussion that had just taken place. This task was intended to help students to integrate the knowledge they had acquired during the debate, and as a result of it. 3. An experiment: multirepresentational collaborative argumentation-based learning. In November 2001 we carried out an experiment in a secondary school in Lyon, using the teaching materials and task sequence described above, together with the DREW CSCL environment. The experiment had two main objectives. Firstly, we aimed to determine the extent to which the teaching materials and task sequence would in fact enable students to deepen and broaden their understanding of the space of debate. Secondly, we wanted to determine the extent to which such understanding would be influenced by the use of an argument-graph drawing tool, in comparison with CHAT interactions. In the experiment, phase (0) lasted for one session of 2 hours; phases 1 to 3 together lasted a second session of 3 hours. The CHAT condition involved 21 students from a single class and the “CHAT+GRAPH” condition, 28 students from a different class. In each case, the students were randomly grouped into dyads (and one triad in the CHAT condition), since we wanted to eliminate the possible effect of dyad constitution (c.f. Quignard & Baker, 1999). With respect to our second objective, we hypothesised that students using the argument graph would acquire deeper and broader understanding of the space of debate than students using CHAT alone. Although verbal interaction (CHAT condition) is an effective means of negotiating meaning, due to its intrinsic or strategic indeterminacy (Edmondson, 1981), we hypothesised that this effect would be outweighed by the fact that diagrammatic representations are more determinate, and thus more memorable (Ainsworth, Bibby & Wood, 1999; Schnotz, 2001; Rouet, 2001; van Someren, Reimann, Boshuizen & de Jong, 1998). The students would thus express more arguments, and would be able to more easily see the ‘gaps’ in their space of debate. The principal interface of the DREW CSCL environment is shown in Figure 2. The CHAT window, with the trace of the interaction is on the left and the argument graph window on the right. In this first version of the software, our aim was to produce a graph that is as simple as possible: boxes for arguments/theses, and only two types of argumentative links (“+” and “–”), whose interpretation is left to the students and their teacher in a given session[iii]. A more important feature concerns the fact that the students are able to express their opinions — “in favour” and “against” — for any element of the argument graph (each person’s opinion appears in a different colour). In order to highlight differences of opinion, and to focus discussion upon them, boxes with respect to which opposed opinions have been expressed appear in a ‘crushed’ form. In this respect, the DREW argument graph tool differs from several others, such as the argument graphs in Suthers’ “Belvédère” system (Suthers & Hundhausen, 2001; Suthers & Weiner, 1995; Suthers 1998; Suthers, Toth & Weiner, 1997), since it is intended to be more a medium through which argumentation dialogue can occur, than as a third-party ‘object’ to be commonly constructed. Several other researchers have studied the role of (computer-based) argument-graphs in learning (see e.g. Veerman, 2000). For example, Suthers and colleagues (ibid.) saw the Belvédère system as a stimulus for conversation and reasoning, rather than as a medium of interaction (contrary to DREW, described above). In initial versions of Belvedere, the argument diagrams contained many different types of nodes and links (e.g. Principle, Theory, Hypothesis, Claim for nodes, and Supports, Explains, Predicts, Conflicts, Justifies, Undercuts, Causes, for links). However, it was found that students spent most of their type arguing about the meaning of these elements, rather than reasoning in the scientific domain itself, so the diagrams were simplified in later versions. Our experiment with DREW can thus be seen as a means of validating design of the learning situation, and as an attempt to determine whether or not argument graphs that are simplified to a small number of link types can after all be effective media of debate and learning. Using the task sequence and teaching materials described above, we asked pairs of students to debate either using CHAT, or else using the DREW argument graph tool, in conjunction with CHAT. 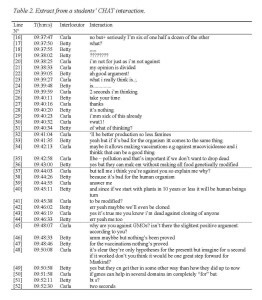 The data collected from the experiment consisted of students’ individual texts, produced before the debate, and then revised after it, together with automatic traces of the interactions themselves. We measured the contribution of the students’ discussions (CHAT or CHAT with the graph tool) to improved understanding of the space of debate by evaluating the differences between individuals’ texts produced before and after the discussion. In order to calculate such differences, we devised a new method for evaluating the quality of the space of debate, as expressed in texts, called the QED[iv] method. The first step of analysis involves segmenting the text into (counter-)arguments, with respect to a principal thesis (e.g. “GMOs should be allowed”), and identifying the student’s general opinion with respect to that thesis (e.g. “against”, “in favour”, “neither for not against”). Each segment must then be classified as a pro or a counter argument with respect to the thesis, then classified in terms of one of a list of epistemological points of view (see above — e.g. “economic”, “ethical”, “agronomic”, …), and finally, its degree of elaboration must be assessed. – coherence: the student’s text is coherent when the general point of view (or opinion) expressed is a rational function of the arguments given (e.g. a pro opinion associated exclusively with counter-arguments is viewed as having low coherence). Figure 3 below shows an example of the texts of a student (Carla), produced before and after debate, for the CHAT-only condition (translated from French to English, keeping students’ punctuation and transliterating spelling or grammatical errors). The text Carla wrote before debate illustrates her divided opinion (neither wholly for nor against). She has a medium coverage of topics (on a scale of low-medium-high) dealing with economics, food, medicine and the environment. Her argumentative balance is heavily in favour of GMOs, with no arguments against. In the light of her expressed opinion — neither for nor against — this fact gives her a low score on coherence, since ideally she should also express arguments against GMOs. In sum, she has a very low QED score (6%). The text Carla wrote after debate reveals that she had decided to support GMOs (pro opinion). She added arguments in three other topic areas (agriculture, public health and scientific risks), thus receiving the highest score for coverage of topics. She developed more balanced arguments since she expressed arguments against GMOs and also gave counter-arguments. She has a high coherence score due to the fact that her arguments now support her opinion. Her new QED score (55%) reflects a noticeable increase in the quality of space of debate. It should be noted that the QED method is restricted to the extent that it only takes the nature of arguments and opinions into account, and not the (discursive, linguistic) structure of the text itself. This is related to practical reasons: in our case, 98 texts had to be analysed, and four other partners in the SCALE project used the method. Such aspects will be taken into account in further work. 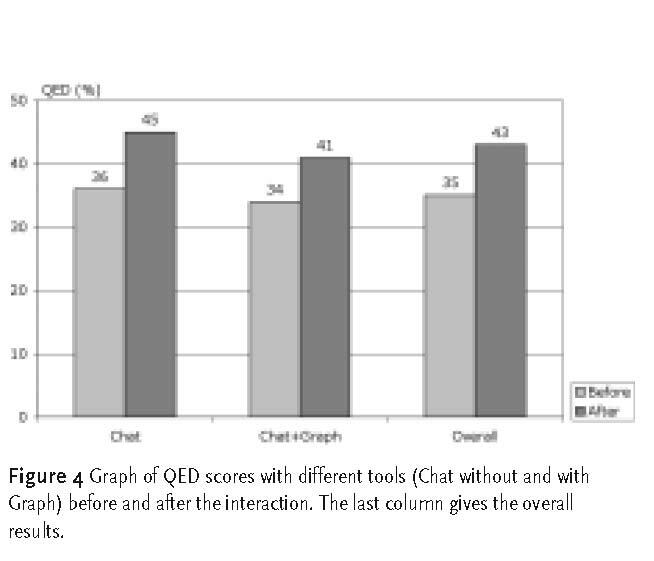 The results of analyses of students’ texts using the QED method[vi] are shown in Figure 4 below. In this experiment, 21 students were in the chat-condition, and 28 students were in the chat-graph-condition. Our first question was: do students QED scores improve significantly, in both conditions? A paired-samples t-test was done on QED scores before and after discussion (pretext and posttext). Results show a significant difference, t(48) =-4.61, p <.001, with a higher QED score after discussion (M= 42.92) than before (M= 34.92). This means that students’ texts showed a higher quality of space of debate after discussion, irrespective of the experimental condition. Our second question was: do students perform better in the chat-only condition than students in the chat-graph condition? The repeated measures show that there was in fact no effect of the interaction between condition and QED-scores, F (1.47) = 0.25, p > .01. 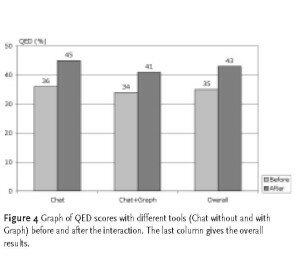 This result indicates that the increase of QED-scores was the same for both students in the chat-condition and students in the chat-graph-condition. Our results, based on differences between QED scores for individual texts before and after debating, show that students’ knowledge of the space of debate for GMOs improved significantly during the experimental task sequence, but that the use of an argument graph for communication, as compared with a CHAT interface, made no significant difference with respect to this improvement. Although the design of our teaching materials and task sequence are thus validated, to the extent that they do in fact enable students’ to acquire more knowledge of the space of the debate, it is not possible to isolate exactly what aspect of them is responsible for this (the design of the teaching materials, the task sequence, etc). This fact is related to the necessity of using a pedagogical sequence that was intended to be genuinely useful and usable in schools: isolating smaller tasks for experimental purposes would have been educationally unacceptable. There are several possible explanations for our negative result with respect to the relative utility of the argument graph tool in this process. One simple explanation relates to problems with interface design that could have prevented the argument graphs from realising their full pedagogical power. Preliminary studies revealed that students spent much effort in rearranging the diagrams in a relatively restricted screen space. Other problems could have related to inefficient interaction caused by the fact that only one student could edit an argumentation element at a given time. A second possible explanation relates to the extent to which students were able to integrate knowledge acquired or co-constructed in the interaction into their individual texts. In the case of the CHAT interaction condition, both the interaction and the texts are in the same semiotic medium: typewritten text. This could thus have helped ‘transfer’ of knowledge from interaction to text. However, in the case of the argument graph interaction, the medium is different — i.e. from a graphical representation (with some interactive CHAT text) to written text — and this requires extra cognitive work, which could have prevented the students in the graph-CHAT condition from performing as well as they could have. An interesting future experiment would therefore be to compare like with like, i.e. “text ( CHAT ( text” compared with “argument graph (argument graph interaction ( argument graph”. A third possible explanation relates to the QED measure itself: perhaps there would have been significant differences had the discursive and linguistic aspects of the textual structure been taken into account. In order to fully interpret our results we are presently carrying out detailed analyses of the students’ interactions themselves. The analysis distinguishes different functional categories of interaction, including interaction and task management, argumentative interaction (Baker, 1999; Quignard, 2000; de Vries, Lund & Baker, 2002) and negotiation of meaning in argumentation, the latter corresponding to ‘deepening’ of the space of debate. This analysis should enable us to understand the extent to which the interface design hindered interaction in the graph condition, and the extent to which the changes in students’ texts can genuinely be explained by knowledge co-construction. (It is of course possible that the learning effects were due to new reflexion on the texts alone, reconstructing from memory the original teaching materials). The following (Table 2) is an extract from a CHAT interaction, in which the student who had produced the texts shown above (Figure 3) had participated. Dotted lines divide the extract into four principal sequences, whether argumentative or not. 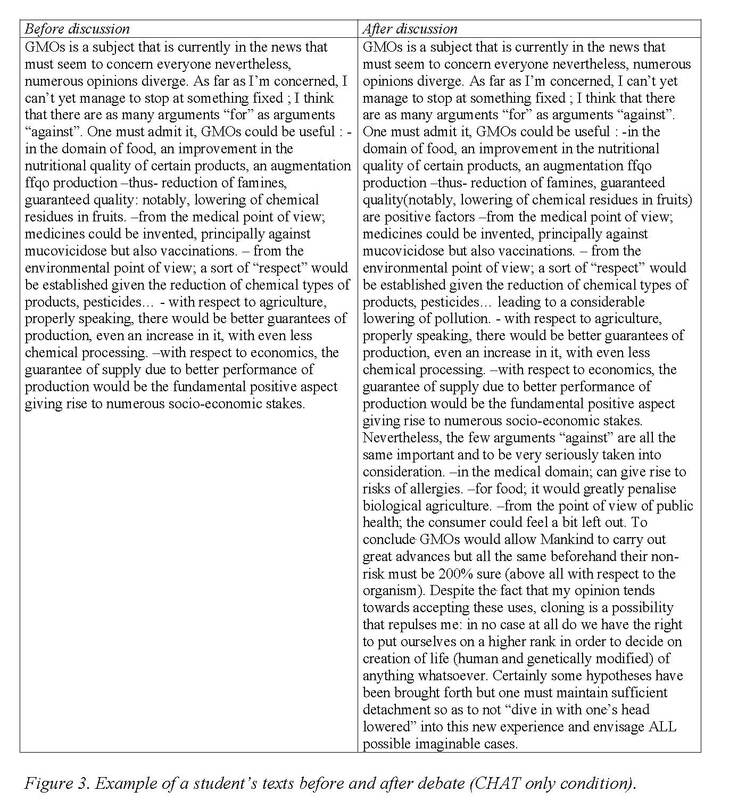 The extract begins (lines  to ) with Carla expressing her opinion with respect to the question “Should production of GMOs be allowed or not?”: she has a divided opinion, neither clearly for nor against, as stated in her original text (Figure 3 above). The main argumentative interaction phase is from lines  to  (in  Carla asks for time to think, thus interrupting this sequence). In the first argumentative subsequence (lines  to ), Carla initiates the dialogue, providing only arguments in favour of GMOs (they will reduce famine, allow vaccinations and reduce pollution). Her adoption of the proponent role (c.f. Barth & Krabbe, 1982) is surprising, given that she said she had a divided opinion. Betty plays the opponent role in this sequence: reducing famine (enabling people to stay alive) is useless if they then eat what is bad for them (GMOs), and vaccinations could be made without genetically modifying food. Since Carla has rendered her point of view explicit, she now asks Betty to do the same, even though this is implicit in the fact that she just adopted the opponent role[vii]. Betty states that GMOs are bad for organisms, then introduces the case of human organisms, and cloning. Betty’s ‘slippery slope’ argument is that if we begin by modifying plant organisms, we will end up modifying (cloning) human organisms. This argument succeeds: Carla has to concede. This process is particularly interesting from the point of view of deepening the space of debate, since the students have also performed a conceptual operation in argumentative interaction (Baker, 1999), whereby GMOs have been associated with cloning (Baker, in press). In the last sequence ( to ), Carla again asks Betty to explain why she is against GMOs, and reverts to her previously expressed ‘neutral’ role in asking whether Betty does not recognise any argument in favour of GMOs. As a means of ‘dissolving’ the verbal conflict, the students relativise arguments with respect to GMOs: they’re only “hypotheses”, “nothing has been proved”. In this extract we can see potentially constructive processes that work on the conceptual background of the space of debate. But what effect did this interaction have on the way in which the students subsequently modified their original texts? Confronted with a tenacious opponent of GMOs, Carla was introduced to a large number of arguments against GMOs. This enabled her to become conscious of the risks linked to this biotechnology. 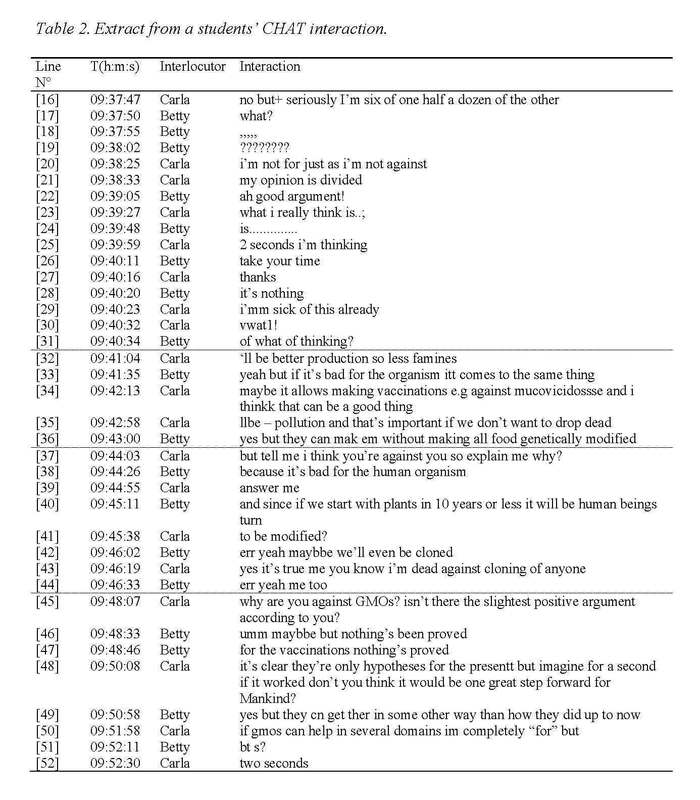 In addition, the fact that Betty insisted that Carla should express her final opinion led to Carla clarifying her position (see Table 3 below). 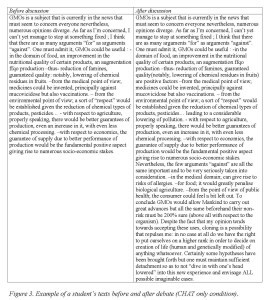 Having such an opponent may explain why Carla added a large section stating potential GMO risks to the end of her text, thus partially re-equilibrating her arguments and clarifying her position. Her argument structure becomes “deeper”, in particular in relation to risks and “broader” in relation to public health and agriculture. As mentioned previously, her text is more “balanced” since she has added arguments against and is more “coherent” since her text better supports her newly expressed point of view. This paper has described research whose aim was to understand how to design situations — teaching materials, task situations and Internet tools — for a specific form of collaborative learning related to argumentative activities: broadening and deepening the space of debate. Our results show that it is in fact possible to create situations in which students will elaborate and express their opinions with respect to subjects taught in school, in argumentative interactions across Internet, provided that teaching materials, tasks and tools are appropriately designed. Nevertheless, given our null result with respect to the contribution of communicating via an argumentation-graph to collaborative argumentation-based learning, our interfaces and task sequences need to be modified to better exploit their full pedagogical potential. We have suggested that remaining within the ‘world’ of argument graphs, in individual and group activities, could produce better results. Another possibility that is being explored in the SCALE project is to generate textual representations of argumentation graphs for students, who could then more easily compare their original texts with their interaction. Finally, we recognise that argumentative interactions have limits as processes by which collaborative learning can occur: although the students may have engaged in a potentially constructive interaction, they might not have ‘really’ (normatively) improved their understanding of the space of debate. One possibility that we are exploring in ongoing research is thus to identify and define the role of teachers in such interactions (c.f. Lund & Baker, 1999). The authors would like to thank all teachers involved in the PRATIC work group — Philippe Brunel, Anne-Marie Chevalier, Jacques Louison, Emmanuelle Villiot-Leclercq — for their collaboration in designing pedagogical activities and materials. Specific acknowledgements are addressed to two teachers that took part in the experiment, Anne-Marie Chevalier and Valérie Raia, for their availability and trust in our tools, and to our collaborators of the Lycée Assomption Bellevue, its director Mr Amel and the network manager Mme Marie-Jo Villedieu. We thank and we congratulate all the students for their enthusiastic participation and constructive remarks. Many thanks to Jerry Andriessen and Marije van Amelsvoort of the University of Utrecht (NL) for collaboration in defining the QED method, and to Marije van Amelsvoort for statistical analyses of the Lyon QED data. Finally, this research could not have been carried out without the collaboration of our colleagues at the École des Mines de St.-Étienne, Annie Corbel, Philippe Jaillon and Jean-Jacques Girardot, who are responsible for the implementation of the DREW Internet tools. Additional special thanks to Philippe Jaillon for essential computational assistance during our school experiment. [ii] This generic task sequence was designed by the GRIC team in Lyon, in collaboration with J. Andriessen and M. van Amelsvoort of the University of Utrecht (Netherlands). The generic sequence was instantiated by each partner of the SCALE project team in a way that was adapted to national educational systems. [iii] See Quignard, this volume, for a description of theoretical foundations of this interface. [iv] Here “QED” stands for “Qualité de l’Espace du Débat” in French, which means “quality of the space of debate”. [vi] The statistical processessing of the QED scores obtained from the students texts was carried out by M. van Amelsvoort (Utrecht University). [vii] This is perhaps an empirical illustration of Barth & Krabbe’s (1982) normative requirement for externalisation of attitudes in formal dialectics? Ainsworth, S.E., Bibby, P.A., & Wood, D.J. (1999). Analysing the costs and benefits of multi-representational learning environments. In M.W. van Someren, P. Reimann, H.P.A. Boshuizen, & T. de Jong (Eds. ), Learning with multiple representations (pp. 120-134). Oxford: Elsevier Science. Baker, M.J. (1996). Argumentation et co-construction des connaissances. Interaction et Cognitions, 1, 2/3, 157-191. Baker, M.J. (1999). Argumentation and Constructive Interaction. In G. Rijlaarsdam & E. Espéret (Series Eds.) & Pierre Coirier and Jerry Andriessen (Vol. Eds.) Studies in Writing: Vol. 5. Foundations of Argumentative Text Processing, 179–202. Amsterdam: University of Amsterdam Press. Baker, M.J. (in press). Argumentative interactions, discursive operations and learning to model in science. 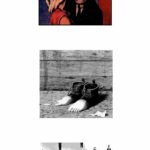 In P. Brna, M. Baker, K. Stenning & A. Tiberghien (Eds. ), The Role of Communication in Learning to Model. Hillsdale N.J.: Lawrence Erlbaum Associates. Bakhtine, M. (1929/1977). [Volochinov, V.N.] Le Marxisme et la Philosophie du Langage. Paris : Minuit. [Ist edition : Voloshinov, Leningrad 1929]. Barth, E.M. & Krabbe, E.C.W. (1982). From Axiom to Dialogue: A philosophical study of logics and argumentation. Berlin: Walter de Gruyter. Clark, H. H & Brennan, S. (1991). Grounding in communication. In L.B. Resnick, J.M. Levine & S.D. Teasley (Eds.) Perspectives on Socially Shared Cognition, pp. 127-149. Washington DC: American Psychological Association. De Vries, E., Lund, K. & Baker, M.J. (2002). Computer-mediated epistemic dialogue: Explanation and argumentation as vehicles for understanding scientific notions. The Journal of the Learning Sciences, 11(1), 63—103. Doise, W. & Mugny, G. (1981). Le développement social de l’intelligence. Paris : InterÉditions. Edmondson, W. (1981). Spoken Discourse : A model for analysis. London : Longman. Golder, C. (1996). Le développement des discours argumentatifs. Lausanne: Delachaux & Niestlé. Koschmann, T. (Ed.) (1996). CSCL: theory and practice of an emerging paradigm. Mahway, New Jersey: Lawrence Erlbaum Associates. Lund, K. & Baker, M.J. (1999). Teachers’ collaborative interpretations of students’ computer-mediated collaborative problem-solving interactions. Proceedings of the International Conference on Artificial Intelligence and Education, Le Mans, July 1999. S.P. Lajoie & M. Vivet (Eds.) Artificial Intelligence in Education, pp. 147-154. Amsterdam : IOS Press. Mevarech, Z.R. & Light, P. H. (1992). Peer-based interaction at the computer: looking backward, looking forward. Learning and Instruction, 2, 275-280. Nonnon, E. (1996). Activités argumentatives et élaboration de connaissances nouvelles: le dialogue comme espace d’exploration. Langue Française, 112 (décembre 1996), 67-87. Quignard, M. & Baker, M.J. (1999). Favouring modellable computer-mediated argumentative dialogue in collaborative problem-solving situations. Proceedings of the International Conference on Artificial Intelligence and Education, Le Mans, July 1999. S.P. Lajoie & M. Vivet (Eds.) Artificial Intelligence in Education, pp. 129-136. Amsterdam : IOS Press. Quignard, M. (2000). Modélisation cognitive de l’argumentation dialoguée. Etudes de dialogues d’eleves en resolution de probleme de sciences physiques. Thèse de doctorat de sciences cognitives. Grenoble : Université Joseph Fourier. [Cognitive modelling of argumentation dialogue. Studies of students in physics problem-solving]. Rommetveit, R. (1979). On the architecture of intersubjectivity. In R. Rommetveit & R. M. Blaker (Eds.) Studies of language, thought, and verbal communication,. pp. 93-108. London: Academic Press. Rouet, J-F. (2001). Designing multimedia systems for learning: Some lessons and further issues. In J-F. Rouet, J. J. Levonen, & A. Biardeau (Eds. ), Multimedia learning: Cognitive and instructional issues (pp. 167-172). Amsterdam: Elsevier Science. Schnotz, W. (2001). Sign systems, technologies, and the acquisition of knowledge. In J-F. Rouet, J. J. Levonen, & A. Biardeau (Eds. ), Multimedia learning: Cognitive and instructional issues (pp. 9-29). Amsterdam: Elsevier Science. Suthers, D. & Hundhausen, C. (2001). Learning by Constructing Collaborative Representations: An Empirical Comparison of Three Alternatives. In P. Dillenbourg, A. Eurelings & K. Hakkarainen (Eds. ), European Perspectives on Computer-Supported Collaborative Learning: Proceedings of the First European Conference on Computer-Supported Collaborative Learning (pp.577-584). Maastricht, The Netherlands: Universiteit Maastricht. Suthers, D. & Weiner, A. (1995). Groupware for developing critical discussion skills. In J. L. Schnase & E. L. Cunnius (Eds. ), Proceedings of Computer Supported Cooperative Learning, Bloomington, Indiana. Suthers, D. (1998). Representations for scaffolding collaborative inquiry on ill-structured problems. Paper presented at the annual conference of the American Educational Research Association, San Diego, California. Suthers, D., Toth, E. and Weiner, A. (1997). An Integrated Approach to Implementing Collaborative Inquiry in the Classroom. Proceedings of the conference on Computer Supported Collaborative Learning: CSCL’97 (pp.272-279). Tiberghien, A., & De Vries, E. (1997). Relating characteristics of learning situations to learner activities. Journal of Computer Assisted Learning, 13, 163-174. Van Someren, M. W., Reimann, P., Boshuizen, H. P. A., & de Jong, T. (1998). Learning with Multiple Representations. Amsterdam : Elsevier Science. Veerman, A. L. (2000). Computer-supported collaborative learning through argumentation. Enschede: PrintPartners Ipskamp. Proefschrift Unversiteit Utrecht. ISSA Proceedings 2010 – Are Motivational Thoughts Persuasive And Valid?